Thrilled to say hi, let me introduce myself… I’m Lucy Felton, Alex and Alexa’s Life + Style Contributor, a fashion journalist turned lifestyle blogger at The Lucy Edit, wife, mum of two (one on the way) and lover of chocolate, décor and buying hordes of magazines I inevitably never get to read! Just like you guys, I’m a mother trying to juggle it all, stay sane and pretend I’ve got all bases covered when I’m generally having a meltdown on the inside and dropping plates left, right and centre. I never get to go to the bathroom alone anymore and can’t remember the last cup of tea I drank hot but would I change it? Of course not! Hopefully, you’ll get to know me a bit over the coming months as I share my motherhood journey with you all. Expect plenty of baby hacks, parenting tips and pregnancy advice. 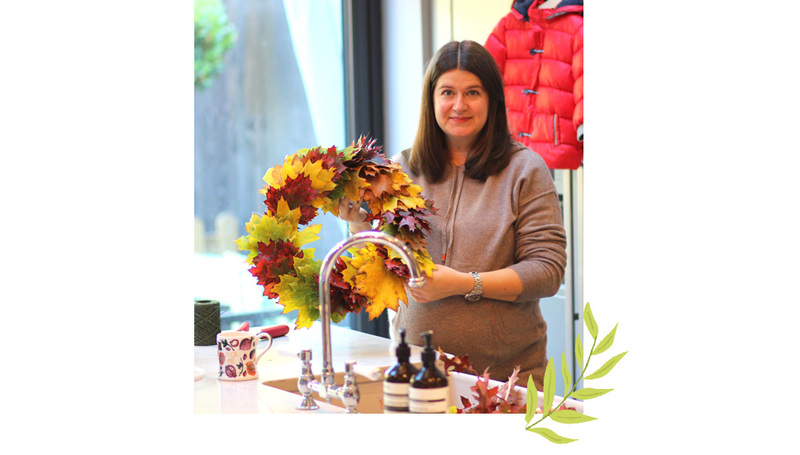 What is it about the autumn/winter season that gets us all crafty and inventive? Must be something to do with the hours spent indoors, the shorter days and cold snaps, that force us indoors for snuggling. Suddenly burning fires, cosy blanket and good family movies on repeat become our priority and all we want to do is make our homes the ultimate happy dens for hunkering down. Well, I know just the way to add some more of that welcoming charm to your nests. 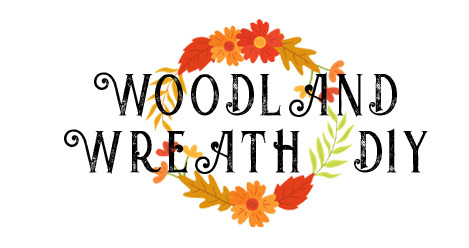 Cue the statement woodland wreath. I’m always keen to find fun ways and ideas to capture my son’s imagination – making things, crafting and anything creative really. 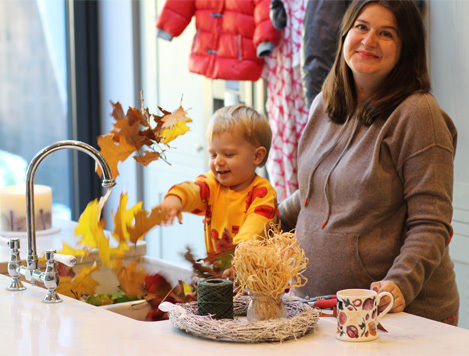 It’s so important to let them explore, discover the new and stimulate their senses and it’s certainly the perfect time of the year to make low-fuss projects with high impact their new favourite activity. A stroll through the park or rummage in your local woods and mother nature’s treasure is everywhere to be found – and for free! Copper leaves, pine cones, you name it. While you might want to leave the Christmas wreath making to the adults (those pines can be prickly!) 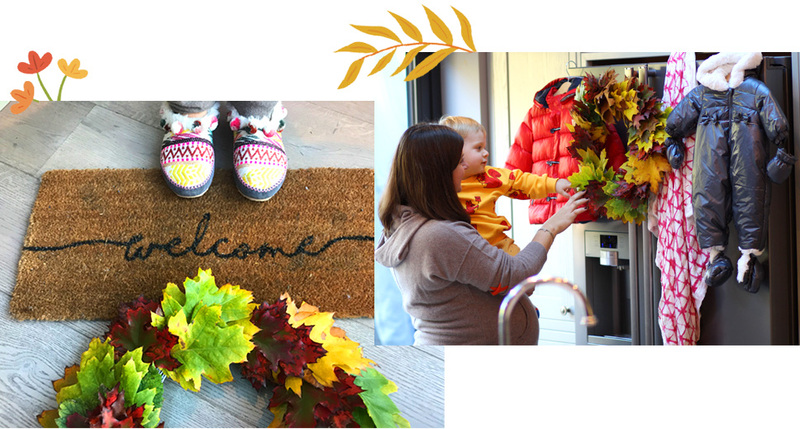 pulling together a woodland autumn wreath is such a great fun pastime to get the kids involved in. Especially if you keep it simple. 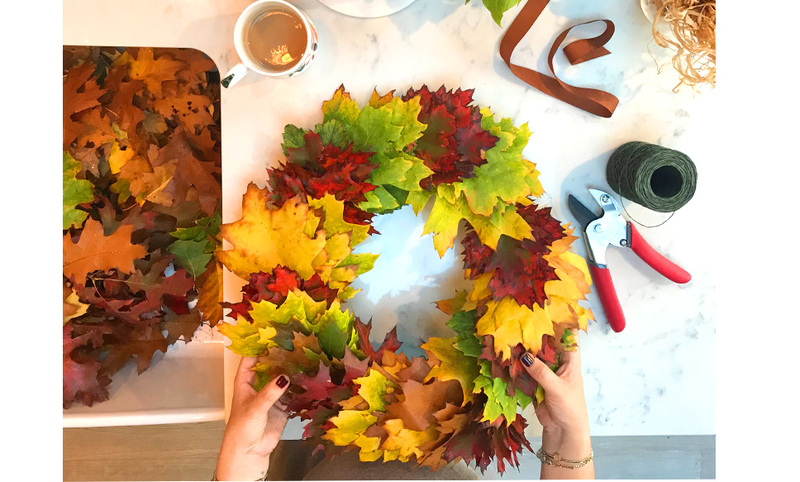 Here’s how to ace a basic leaf wreath for an anything-but-basic cosy autumn décor boost! 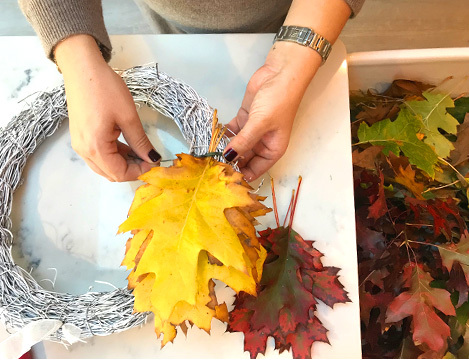 Head out bright and early to your local woods or park and task the kids with collecting as much of nature’s materials that can be used to create a beautiful wreath. For ours, Hector and I stuck to leaves in everything from copper to yellow, but a few pinecones and sprigs of berries would also have looked fab. Let their imaginations run wild. And don’t forget to take some bags. Head home and get everything else together. You can pick up wreath bases in florists, supermarkets and craft stores. I went for a willow one that I can reuse throughout the season. Once the leaves start to crumble in a few weeks, I’ll add in some top-up pieces to spruce it up and get the most out of it. Some floristry wire (get the kind that’s wrapped in paper) is the easiest way to secure foliage but be sure to snip it with secateurs if you don’t want to blunt the kitchen scissors. Lastly, you’ll need some ribbon for hanging. 3. Have Fun & Get Creative! By this point, the kids have probably lost interest! Hector is still very young but he loved throwing the leaves around the kitchen. I encouraged him to pick out a handful of leaves for me while I wrapped the bunches together with the wire. 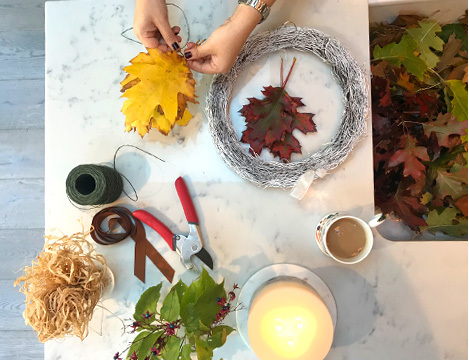 Leave a long length of wire at the end so that you can wrap and secure the bunches of leaves straight onto the wreath base in one go. Coil around and twist to secure tightly at the back. Continue to add your leaves around the wreath, slightly overlapping them, tucking under as you go. 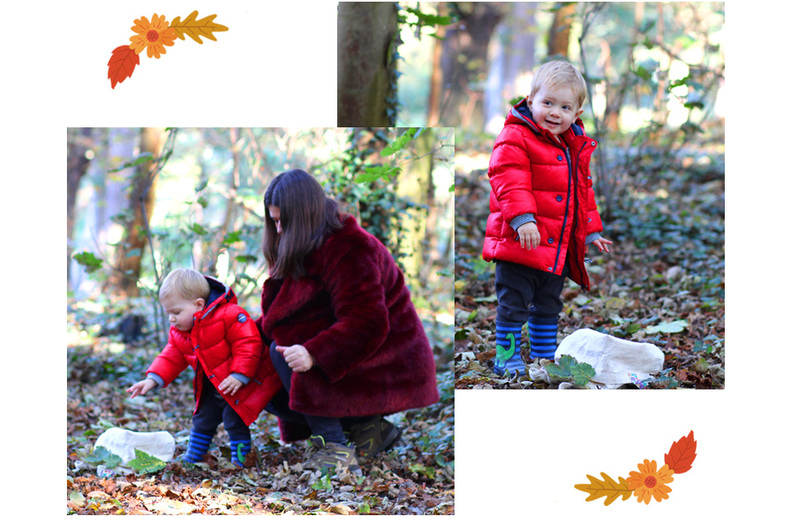 Hector loved collecting all of the leaves in our local woods. He threw them everywhere! We headed out on a really crisp autumn morning, wrapping up in our big coats and boots and took in all of the fresh air. Can’t beat it! 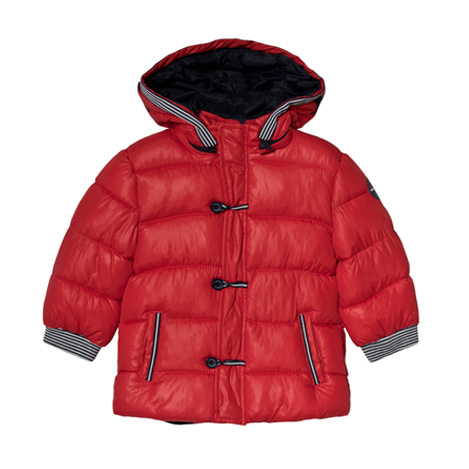 His red Mayoral puffer really stood up to the cold and also gave him the freedom to move and run around. It’s going to be our winter staple. Remember to throw an old pair of Wellingtons underneath the pram and switch over their footwear if it’s wet and muddy. 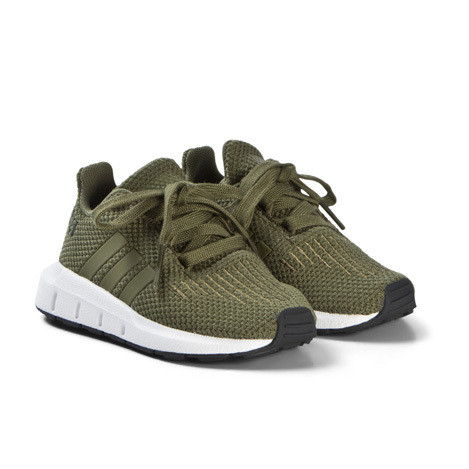 His khaki Adidas trainers are his everyday go-to’s so I didn’t want them getting ruined once we ventured deeper into the woods! I’m now on the last few days before my baby daughter makes an appearance, it’s been panic nesting 24/7 in our house, I can tell you! Hector has been helping to pack his sister’s hospital bag – crammed with newborn delights like this Aden and Anais dream blanket. 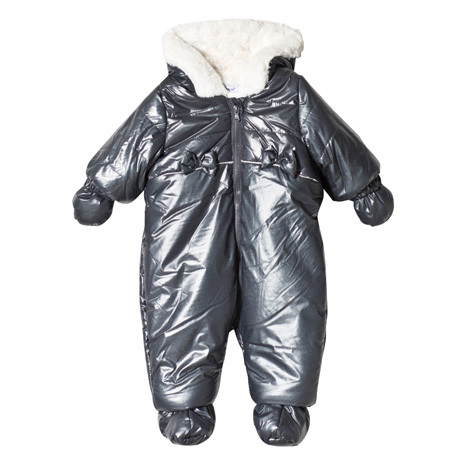 I can’t wait for the first walk in the park post-hospital too now this Absorba pramsuit is ready and waiting for her. It’s the ultimate mini cosy goals and check out the bows. One piece I know she’s going to live in right through to spring. It’s going to be so nice for Hector to finally have a playmate in the house, but any tips for the first weeks of adjusting to life with two tiny ones would be so appreciated gang… What are your mum hacks for bringing a new baby home to meet siblings? Oh, and how am I going to survive the first trip out with two under two – a double pram is new territory! Let me know how you found it all in the comments below, would love to hear your wisdom. 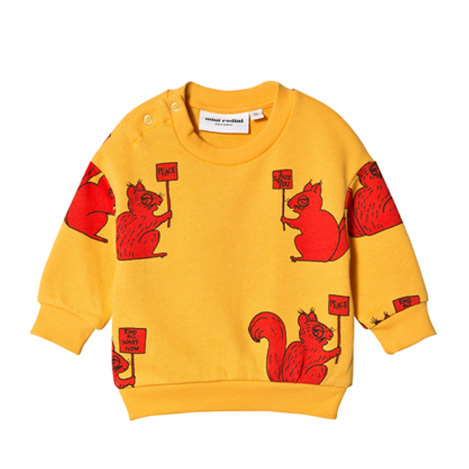 I’ll be sharing more fashion, baby and parenting over at my blog The Lucy Edit and Instagram @TheLucyEdit so please swing by and get involved in the conversation. Next time, she’ll be here! Looking forward to sharing our exciting newborn news with you all very soon.